Meeting begins process of "strengthening the ties of Jewish communities throughout the world with Israel." MK Rabbi Dov Lipman (Yesh Atid) hosted representatives of the Jewish Federations of North America in the Knesset Thursday. The meeting was initiated by MK Lipman to begin the process of strengthening the ties of Jewish communities throughout the world with Israel. Representatives expressed their excitement over the fact that a new Knesset member understood the significance of the relationship between the State of Israel and Diaspora Jewry and offered many concrete suggestions regarding how the American born Knesset member could use his new role to deepen those ties. The meeting concluded with a plan for a follow-up meeting once MK Lipman and his staff devise a plan of action based on the feedback and input of the representatives. 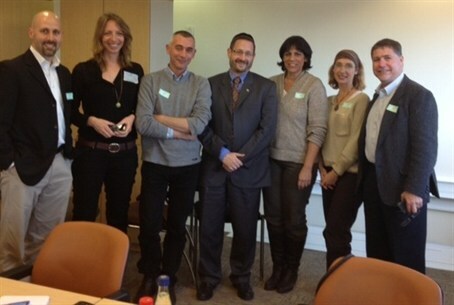 MK Rabbi Lipman said, "A strong connection between the State of Israel and Diaspora Jewry is critical for a strong Israel and a strong worldwide Jewry. Having grown up volunteering on Super Sunday for the Jewish Federation of Greater Washington, I understand how critical it is to foster a close relationship specifically with the federation community. "I appreciated the time the federation representatives took to brief me and to share their suggestions," the new MK added. "Many action items are already taking shape in my mind and I look forward to an ongoing relationship with them and with all the Jewish communities in the Diaspora. I view today as the beginning of a new dawn for this crucial relationship which will translate into a prouder and more Jewish Israel, and help Jews reconnect with their Jewish communities worldwide."